New naming contest on Desall.com: IGPDecaux and Desall invite you to propose new names for a series of advertising products sold by the company, classified by category according to the area they target. Download the Material files . IGPDecaux is looking for a new set of names to identify its own products dedicated to communication and advertising (surface transportation, urban furnishing, subway, etc. ), suggesting intuitive, self-explanatory names, easy to remember and to communicate to its own clients. For all the details, you are required to download the Material files . Each category comprises different products, that vary according to the targeted area and other parameters, as better specified in the Material files. Each category corresponds to one award, as further detailed in the relevant paragraph. Aim of the contest: for each category subject of the contest – that is Dinamica, Digital and Metropolitana – you are required to create a list of names to identify the products specified in the relevant table attached inside the Material files . The names shall convey in an intuitive way, easy to remember and to communicate, the main features that characterise the products, specified in the blue columns of the tables attached (see Material files ). For the sole “Dinamica” category, you are also invited to propose a new category name, to better represent the area targeted by the products, that is urban vehicles such as buses, trams and trolleybuses. In order to access all the information of the categories and of the products, you are required to download the Material files. -	Be easily communicable, that is written in an understandable language, simple and not technical. The names shall preferably be coherent with one another, even if belonging to different categories. Target: the buyers of the products offered by IGPDecaux, subject of the contest, will be both intermediary agencies (media centres and creative agencies) and final customers (companies) that wish to purchase the advertising solution of their interest. -	Product-list.PDF: with explanatory tables of the various categories, the features of the products, some photo examples, further indications on the placement, etc. -	Submission-forms: inside this folder, you will find three Excel files (.xlsx), containing the list of products to rename and the column where to write your solutions. It is fundamental that you write your proposals inside this .xlsx files. The .xlsx files can be opened with Microsoft Excel, Google Sheets, Openoffice or other spreadsheet software. -	In the “Archive file” field, attach a .ZIP archive (not .rar or other extensions) containing the Excel file filled in with your proposals, based on the category for which you are sending the names. Every upload shall correspond exclusively to one category. Submissions NOT containing all the names required for the category, might not be taken into consideration for the final selection. Naming language: you may submit your name proposals either in Italian or in English, as you prefer. IGPDecaux would prefer the use of English, but it is not mandatory. The language choice will in no way influence the final judgement, that will be exclusively based on the quality of the proposals. Participation is free of charge and open to designers and creative talents of any nationality aged 18 years or older. Participants can present one or more projects, but only the projects published on the www.desall.com web site, via the upload page related to “Name the ADV” will be accepted. The selection of the winner by IGPDecaux will be the result of an unquestionable evaluation and it will take into account originality, feasibility and consistency with the brief presented. For the duration of the option right, the Sponsor offers an extra chance to all participants setting a fee of Euro 500,00= (five-hundred/00) for the purchase of the license for the economical exploitation of the projects not-acknowledged as the winning proposals. 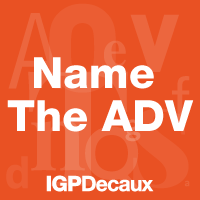 Do you want to stay updated about "Name the ADV"?